A field of 144 participants raised over $100,000 to support Goodwin College students at the 9th Annual Golf Tournament on September 17. The 9th Annual Goodwin College Golf Tournament was a beautiful day of good golf and great company, when the donors who help support the College’s scholarships got the opportunity to sit down with a few of the students who benefit from their generosity. On September 17, a field of 144 donors, sponsors, and employees came together to play in the golf tournament to raise money for Goodwin’s Endowed Scholarship Fund, which will help expand scholarship opportunities for years to come. The sponsors at the golf tournament raised over $100,000 to support scholarships in a fun, relaxed atmosphere at Topstone Golf Course in South Windsor. Two of the three 2014 scholarship recipients were on hand at the reception following the tournament: Annmarie Goenne and Senita Pinckney. Gladys Mercado also received a 2014 scholarship, but was not in attendance. Goenne had enrolled in the Respiratory Care program at Goodwin in September 2011, but was involved in a life-changing, head-on collision during finals in April of last year. Despite the physical, emotional, and mental toll of the accident, she has managed to retain a 3.94 GPA and is determined to graduate in August 2015. Goenne said she was extremely grateful to Goodwin and the scholarship sponsors, who helped support her in her time of need. Pinckney began at Goodwin College in 2003, juggling a full-time job, wedding plans, and a growing family. In 2008, just three classes shy of completing her nursing degree, she was involved in a traumatic injury that left her unable to meet the physical requirements to complete the nursing program. After recovering, Pinckney enrolled in Goodwin’s Human Services program in 2010 and will graduate in December of this year. “This scholarship means I can finish my bachelor’s this semester and go on to get my master’s,” Pinckney said. She plans on using her life to attempting to help others, she said. Ernie Hutt, owner of Augie & Ray’s Drive In in East Hartford, was directly responsible for helping to fund Pinckney’s scholarship. 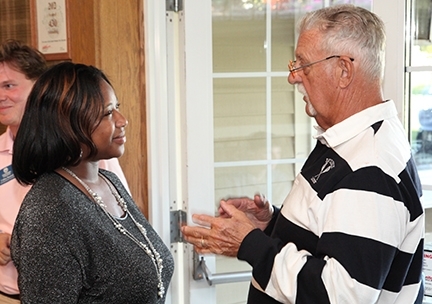 For Hutt, being able to see students like Pinckney at the Golf Tournament is its own reward. “To see the smile on their faces means an awful lot to me,” Hutt said. View photos on our Flickr account. Sorry I couldn’t be there with you gals– I was scheduled to attend a four-day training at the USNA that week.